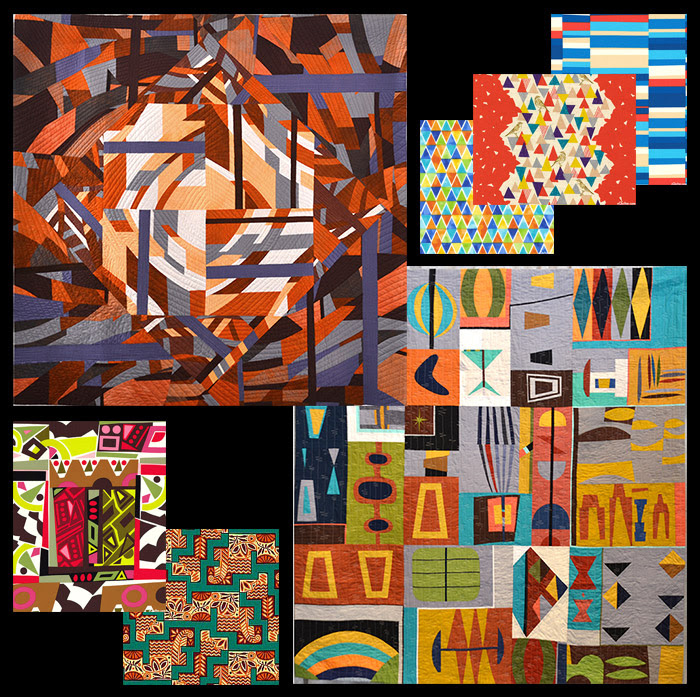 My RoundAbout quilt that was in QuiltCon was featured in the recent eQuilter Newsletter by Luana Rubin. Having just returned from QuiltCon in Pasadena, I am anxious to show you what the Modern Quilters are up to these days! The quilt in the upper left hand corner is "RoundAbout" by Marcia DeCamp from Palmyra New York. It represents a busy traffic intersection, and was made with improvisational piecing. It was machine quilted on a frame, using hand-dyed fabrics. The quilt in the lower right is "Mod Mood" by Debbie Jeske of the Seattle Modern Quilt Guild, and her Bee Sewcial sewing group - an improv, solids-only bee where members are encouraged to push their creative boundaries. The bee's prompt was a Pinterest board with Mid-Century Modern designs, including a MCM color palette. Modern quilters still talk about how the Gee's Bend quilts influenced them, and inspired their improvisational piecing. Nancy Crow is of course another icon of the improve piecing genre. I think it is so cool that the Modern Quilters have re-made the Quilting Bee....and made it their own! 'Mod Mood' reminds me of some Mod Barkcloth that we used to carry. I wish our suppliers would reprint those great Barkcloth designs...they look like something from the set of a James Bond movie. Ha! I will continue to post photos from QuiltCon on my photo page. To find out more about this annual show, or to join a local Modern Quilt Guild in your area, visit their website.